Writing a review right after I've finished this probably isn't such a good idea because there's a chance I won't make too much sense so sorry in advance. The thing about this book is that it's so damn good and so captivating and addicting that I had a hard time putting it away. To be honest, I was wary of it at first. I didn't know what to exactly expect, though I saw mostly positive reviews from the people I trust to. Still, this kind of book can always go wrong and, let's be honest, that happens quite often. But I couldn't resist the beautiful cover (seriously, look at it!!!!) so I had to have it. I wasn't disappointed at all. Everneath had everything that I hoped for. The storyline was interesting and handled very well (as well as researched), characters were lovable without any of them being perfect. They all had their own flaws, none of them were threated like gods or goddesses, and even though Nikki wasn't threating everyone like they were above her, she wasn't an annoying heroine (note sarcasm). Jack was your normal, high school boy with nothing extraordinary or perfect about him which was probably one of the things I liked the most about. 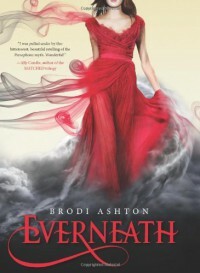 Paranormal YA authors these days know to make their characters so perfect that their perfection is almost (or really is) insufferable, but this wasn't the case with Brodi Ashton. Cole may not exactly be normal but he wasn't described like some god coming to save Nikki as well. What is even more surprising is that not one of these characters annoyed me or maybe make me want to vomit or anything similar. In fact, I loved them all. They all had their reasons for the way they acted. They all had their personalities built so all of them were each for their own. None of them had only one role (i.e. serving as only someone's love interest) which was refreshing. Moreover, I liked the pace. It wasn't too slow nor too fast. I found myself reading it to the point where I'd read five chapters without looking up. If I was still on holidays, I'd probably finish this sooner but these free days I have were enough I guess. The storyline was intriguing and well researched. I'm a sucker for Greek mythology and I've always found the subject interesting so I was pleased to see this was done well. This one's going to my favourites pile because I still can't get it out of my head. I also don't think it will for a long time.